Rustem Pasha Mosque is an Ottoman mosque located near the Hasircilar Carsisi Weavers Market just next to Golden Horn in Istanbul, Turkey.This mosque was built between 1561 and 1563 by princess Mihrimah in the memory of her husband Rustem Pasha who died in July, 1561. She was the daughter of Suleyman the magnificent. The mosque is oriented along a northeast axis and is also elevated on a plateau of one vaulted sub-structure that contains the market place. 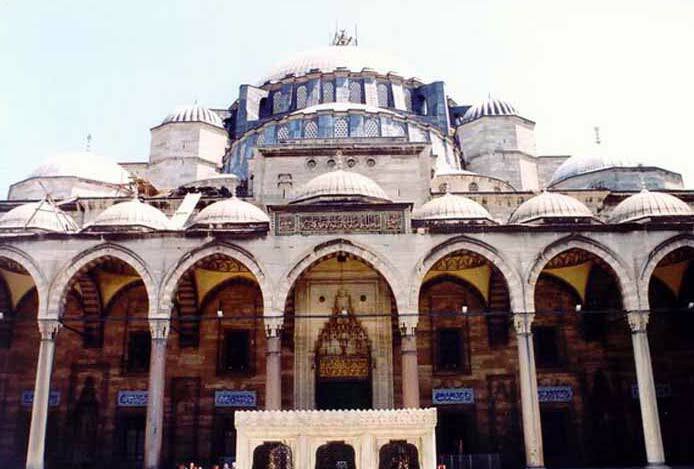 The mosque consists of one octagonal structure that is configured into a rectangular prayer hall that is flanked by two wings. It is covered with a huge central dome. A five dome portico that is just adjacent to northeastern elevation is adjoined by a second exterior portico with a pitched roof. From western corner of the prayer hall, a cylindrical minaret emerges. 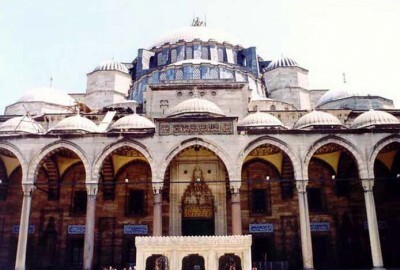 In order to access the elevated plateaus of this mosque there are four staircases. The main entrance of this mosque is actually located at the center of northern elevation. Rustem Pasha Mosque is famous for the lavish use of Iznik tiles to decorate the walls with a wide variety of geometrical and pretty floral patterns. These tiles exhibit the early use of a tomato-red color that would later become characteristic of the Iznik pottery. Some of those tiles, especially in a large panel under portico on the left main entrance, are basically decorated with sage green and some dark manganese purple. This is characteristic of the early ‘Damascus Ware’ coloring scheme. There is no other mosque in Istanbul that has made such an extensive use of Iznik tiles.